ZEROPLUS Logic Analyzer supports the Protocol Analyzer NEC PD6122, which is a kind of Infrared IC and developed by the NEC. Nowadays, there are a lot of IC Signal Formats on the market. However, the NEC PD6122 is a kind of unique specification, which is used more and more widely. At the same time, there are more and more manufacturers that use the IR Format of the NEC to develop the new products. With the great change of the Technology, the Transmission Technology of the Digital Signal is used more and more widely in our daily life. However, these signals also need the corresponding Development Tools, which are convenient for the engineer to finish their R&D Work smoothly. 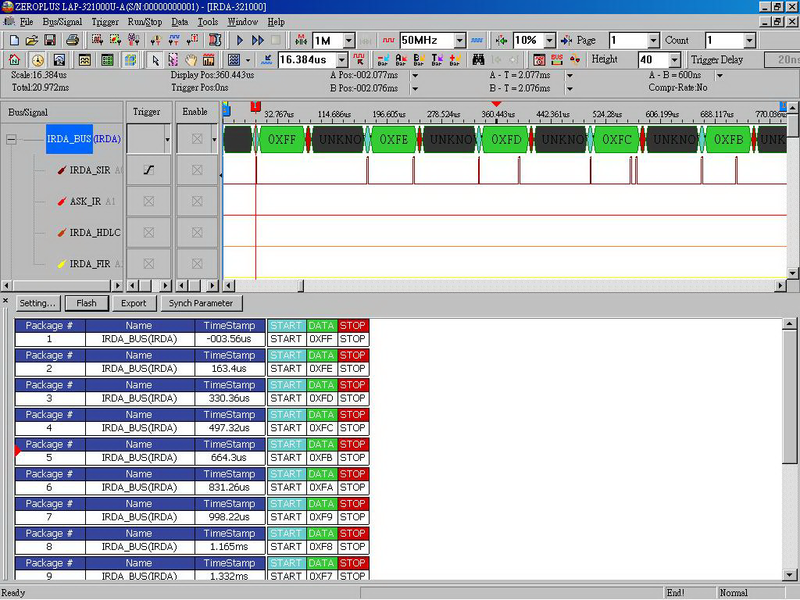 The ZEROPLUS Logic Analyzer and the Automatic Decoding Software of the Protocol Analyzer can help you shorten the time to develop the signals, improve the efficiency to develop the products and reduce the cost to develop the instruments. With the help of the functions of the Software, the Transmission Data, which is no need to be calculated by manual, in the signal can be displayed automatically. At the same time, you can supply the correlative data for ZEROPLUS, it will help you make the exclusive Protocol Analyzer Software. RC5 Infrared Remote Control Format, developed by Philips, is a kind of infrared remote control signal protocol. Although Philips has developed a more comprehensive RC6 Standard, most electronic products of Philips still utilize the RC5 Infrared Remote Control Format at present, and it can switch with the NEC Infrared Remote Control Format. RC6 Infrared Remote Control Format, developed by Philips, is a new infrared remote control signal protocol. And it is similar to RC5 in the structure. Philips RC6 Remote Control Signal utilizes 36K carrier. A bit information, which is transmitted each time, occupies 32 carrier periods (about 889us). The time transmitted by infrared and the idle time occupies half of the carrier period (444US) respectively. That is to say, the time transmitted by the infrared signal is 16 carrier periods, and the idle time is also 16 carrier periods. If the transmission time is previous to the idle time, it indicates that the transmitted value is “1”; if the idle time is previous to the transmission time, it indicates that the transmitted value is “0”. The PT2262/PT2272 is a kind of Remote Control Encoder/Decoder, which is designed by Princeton. It has the CMOS Process and the features, such as Low Power Consumption and Low Cost. The PT2262/PT2272 signal can be transmitted by the RF or IR modulation. The PT2262/PT2272 can have the 12-bit tri-state Address Pin at most, so it can supply 531441 kinds of Address and reduce the repeatability of encoding the data greatly.